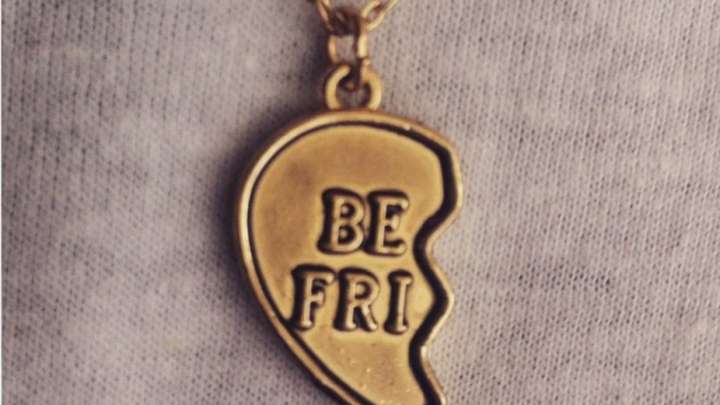 Being someones BFF is a big deal you dont hand over the other half of your Best Friends necklace to just anyone. Having a romantic partner who is also your best friend potentially sounds perfect. With your BFF as your romantic partner, you get the best of both worlds, someone with whom you can laugh, share your life and cuddle. When you look at seemingly happy celebrity couples like Ashton Kutcher and Mila Kunis, or Leslie Mann and Judd Apatow, not only do they appear to be in love, but they also seem to genuinely enjoy hanging out together. How many people feel as though they have attained that type of ideal? And do psychologists confirm this new paradigm is a good one to strive for? I enlisted the help of Monmouth University Polling Institute to investigate. To help figure out how many best-friend couples are out there, we asked 801 adults across the United States the following question: Do you consider your partner to be your best friend or do you call somebody else your best friend? Among adults currently in a romantic relationship, the vast majority (83 percent) considered their current partner to be their best friend. For those who are currently married, the rate was even higher. Men and women had similar rates, while younger respondents were slightly less likely than older respondents to view their partner as their best friend. The overall numbers from this recent poll dwarf the earlier reported rate of best-friend romantic partners. In a 1993 study, only 44 percent of college students indicated their romantic partner was also their best bud. The difference in best-friend/love rates almost doubling over the past 20 years could just be an artifact of the published researchs college student sample. But expectations for modern relationships have evolved in the intervening years. Compared to previous generations, todays heterosexual men and women are more accustomed to thinking of each other as friends on equal footing, even outside of the romantic realm. Once a romantic couple forms, were more likely to look for more egalitarian splits of power and divisions of labor. We hold our relationships to higher standards than we have in previous decades. In particular, couples now expect their relationships to promote personal growth and help individuals fulfill their own goals. For example, your partner should help you become a better person by teaching you new things like how to make the perfect creme brulee, taking you places like the cool new trampoline park and opening your eyes to new perspectives such as the benefits of eating a more vegetarian-based diet. Although this expectation for growth could conceivably place an unwieldy burden on your relationship, researchers believe that modern relationships are up to the task. In fact, the idea that a relationship can help an individual become a better person, a phenomenon that researchers call self-expansion, is a useful one; relationships that provide more expansion are also of higher quality. In order to hit all these self-improvement targets, you may need more from a spouse or romantic partner than was expected in years past and a partner who is also your best friend may be a step in the right direction. To see if those who consider their partner their best friend also expect more from them, the Monmouth University Poll asked, For an ideal relationship, how much should you expect your partner to help you grow and expand as a person? Our poll results indicated generally high expectations overall, and individuals with best-friend romantic partners expected a bit more from them. Of course, while individuals can expect more, that wont automatically translate into better results. Think of it this way: Simply because you want more from your job, it doesnt guarantee youre going to get what you want. We wanted to see if these best-friend romances were really better. To do that, we asked poll respondents, How satisfied are you with your current relationship extremely, very, somewhat, not too, or not at all satisfied? We then compared those who said their partner was their best friend to those who responded it was someone else. Those who considered their partner their best friend were indeed much more satisfied in their relationship than those who didnt. This finding is consistent with research showing that relationships with more companionate love based on friendship, feelings of affection, comfort and shared interests last longer and are more satisfying. In fact, companionate love is more closely associated with relationship satisfaction than is passionate love the type of romantic love based on intense feelings of attraction and preoccupation with ones partner. Other research shows that those in friendship-based love relationships feel they have a highly likable partner, and that shared companionship is an important part of the love. A study of 622 married individuals revealed that those with higher scores on the friendship-based love scale also reported more relationship satisfaction, greater perceived importance of the relationship, greater respect for their spouse, and felt closer to their spouse. More recently, across two studies with nearly 400 participants in relationships, those who place more value on the friendship aspect of their relationship also report more commitment, more love and greater sexual gratification. In addition, valuing friendship also decreased the chances of the couple breaking up. Best-friend love is starting to sound better and better. All of these benefits are backed up by accounts from a special type of relationship expert: couples whove been happily married for over 15 years. When researchers asked over 350 of these couples about their secret to relationship success and longevity, what was the number one reason? Simple: their partner was their best friend. The second most common response was liking their spouse as a person, another key facet of friendship-based love. Why are best-friend partners so beneficial? These findings demonstrating the benefits of dating or marrying your best friend make perfect sense when you consider the type of relationship best friends share. Friends enjoy spending time together, share similar interests, take care of each other, trust each other and feel a lasting bond between them. It isnt a coincidence that these all happen to be qualities that also define successful intimate relationships. By recognizing the parallels between best friends and romantic partners, you can benefit from holding both types of relationships to the same standards. All too often it seems individuals are overly forgiving of a relationship partners bad behavior, when they would never accept similar behaviors from a friend. For example, if your friend was mean, rude, perpetually grumpy, nagging, dishonest, argumentative, emotionally unstable, ignored your texts, called you names or didnt want to have meaningful conversations with you, would you still want to be friends? If not, its fair to hold similar expectations for your romantic partner. Take the time to find a romantic partner who truly is your best friend. To be clear, the argument here isnt that you should try to convert an existing best friend into a romantic partner. You may not want to run the risk of compromising that friendship, anyway. Rather, the data here point out the importance of your romantic partner also being one of your best friends. Ultimately, the best way to have true love forever may be to be best friends forever first.